I always feel lucky in that my work allows me to travel to places I have never been to but always wanted to visit. Case in point: Vienna, Austria. Although I always hoped my first trip to this wonderfully imperial European capital would have been simply for pleasure, on the arm of someone special, it so happened that I set foot on it on a business trip - but what a trip! Last December was my first, really quick first contact with the city, on a day trip which involved four different planes and respective airports - I only managed to catch a glimpse of the city when my dear collaborator and colleague Peter took me for a speedy drive on the Ringstrasse, where all the main buildings are located - then I made my promise to see Vienna better on my return. Arriving on the Vienna International Airport on Sunday afternoon, I took the modern CAT train (City-Airport-Train) to the center of the city. Although the green and yellow graphics of this fast transportation were to my taste, the machine-only-tickets left me a bit disappointed: I could not manage any of the three automatic ticket machines to accept any of my bank notes, so I ended up using my personal credit card. The trip to the city is 15 minutes and you pay 9 euros for a single ticket from the airport to the center: just like in Athens but taking a much more comfortable and fast train. The switch between train and Underground (the U-Bahn) was a bit tricky: expansion works at the Vienna Mitte/Landstraße stations meant we had to get out of the one ant walk around it to enter the other. Works should be finishing within the year, so all that will be but a memory. The Vienna Underground is fast and efficient, with the various corresponding lines programmed so well that I rarely had to wait for more than two minutes to get my second train. Ticket machines are easy to use and there are also ticket booths (Vorverkauf) in most stations. There are various tickets for tourists, which include discounts in sights and museums across the city. I got myself the weekly ticket, because the price was very attractive, although it did not contain any of the discounts: 14 euros for the whole week! Arriving at my living quarters, the Royal Hotel at Singerstrasse, my first impression was the breathtaking sight of Stephansdom, or Steffl (little Stephen), the Vienna Cathedral., after coming out from the U-Bahn steps. A Gothic masterpiece, it deserves its own post, so I will dedicate on to it on my Pillars of the Earth series. Managing to peel my eyes of it, I turned around and looked at the Stephansplatz, the heart of the city. Magnificent baroque and not-so great modern buildings surround it, with two of the main Innere Stadt (Inner city, the 1st district of the 23 Bezirke that comprise Vienna) streets crossing right on it: Graben and Kärntner Strasse. Graben was amazingly decorated for Christmas with enormous chandelier-like lights, making it look like a surreal outdoors ballroom. And of course, ballrooms are so popular in Vienna, eh? Graben and the left over Christmas decoration - at least I was not the only one leaving my holiday decorations up until mid-January! I arrived at my hotel and, after checking in at the reception, with the very polite and helpful staff, I took the elevator to my room. The building is old but very clean and the rooms are big and comfortable, furnished in baroque looking furniture. I had a standard room, that had a double bed in a very big space, a large bathroom and a separate toilet room inside it. The bathroom walls were decorated with a colorful mosaic! All rooms are equipped with WC, bath or shower, direct-dial phone, mini-bar, free cable-TV, radio, safe and hair-dryer as well as high-speed Internet access via modem. No wi-fi unless you are in the lobby or the ground floor restaurant, Firenze Enoteca, where we had our breakfast every morning, but, the price being 3 euros for half an hour, I decided to wait until I found a free hot spot to test my iPhone abroad. I opened my suitcase and arranged my clothes in the closet and toiletries in the bathroom, showered, dressed and was ready for my first walk in Vienna! My room! Or at least part of it! The bathroom mosaic - crazy! As it was getting a bit late, I decided to skip coffee and head straight for dinner. After walking through Kärntner Strasse up to Philharmoniker Strasse behind the famous Staatsoper, I arrived at Albertinaplatz and the Albertina museum. Here is a monument to the Holocaust too. But it was not time for museum seeing, so I pressed on to Operngasse and arrived at the Secession Building, the exhibition space that was built for the artists of the Viennese elite back in 1898. The Secessionists displayed their incredible works there, with most notably the 1902 exhibition dedicated to Beethoven. Secession. Yes, that is gold leaf you see shining in the night! Fine Baroque church: Karlskirche at Resselpark. The dome reaches 72m. As it was late, I could only admire the outside and vowed to return another day. After managing to almost get lost (even stumbling onto the magnificently Baroque Karlskirche did not make me realise I was going towards the opposite direction), I found my way through to the MuseumsQuartier, the big group of exhibition buildings right across the street from the twin museums: Kunsthistorisches Museum and Naturhistorisches Museum. 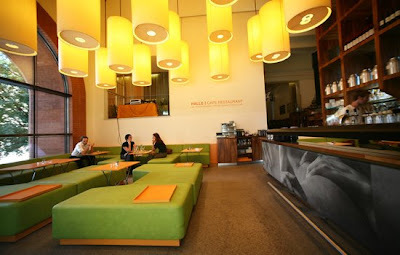 My destination was none other then the cafe-restaurant of the Kunsthalle, called simply Halle. Halle, designed by Eichinger oder Knechtl, is located inside the building that partly houses Kunsthalle, the Emperor's Loge of the former winter riding hall. 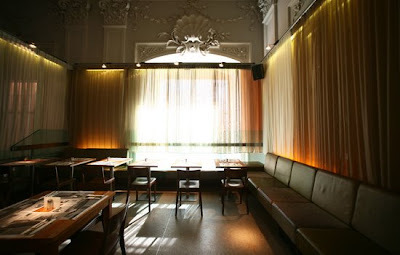 It was opened in 2001 by the people that made Motto one of the must-eat places in Vienna, Bernd Schlacher and his team. The relaxed atmosphere and modern furnishings inside the baroque high-ceiling spaces (you enter in the minimalistic cafe area, to proceed to three different spaces to eat), prepare you for a wonderful experience. Very friendly and good-looking waiters see you to your seat and quickly take your order, to serve you with some of the best food I tasted in Vienna: A leaf salad with nuts, Grana cheese and grapes started me off, to continue with an amazing garlic chicken with diced mango and tomato bits, accompanied by potatoes. I had a glass of lovely Viennese Riesling wine to drink and then a new friend arrived: Toph! I had my dinner at this very room!!! Only the walls were plastered with photos of an exhibition, most of them from Constantinople! This stand shares a concept with the one I designed for our company back in late November, for the Exporama fair. The final design was a rather different take on my concept, but my original idea looked a lot like this one, europalletes and all! Imagine my pleasant surprise seeing it right her in Vienna! 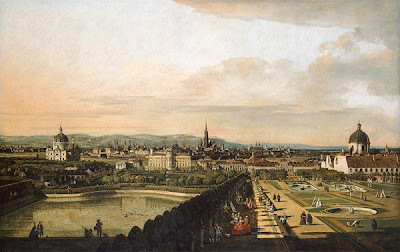 We then moved down the park between the twin museums, where the huge Maria Theresia statue lies, on to the Hofburg palace complex, one of the many Imperial palaces adorning the city. Neue Burg, the newest part of Hofburg, was the place where Hitler made his address speech during a rally when he visited Vienna in 1938 after the Anschluss (see photo below). Walking further under the buildings (there are roads and passages going under most of the palace buildings, making it so easy to cross this huge building complex) we stumbled upon the In Der Burg (in the palace, those imaginative names!) courtyard that led us to the domed entrance of the Kaiserappartements, Michaelertor. The entrance to the Imperial Apartments! We were now in Michaelerplatz, named from the St. Michael church on it. Toph was excited showing me the Roman ruins of a legionary outpost and a crossroads that were unearthed during digging for the U3 line of the U-Bahn. The sheer size of them (multiple layerings of walls) makes you thing about the hidden history beneath the old palaces of the city. We kept walking towards Stephansplatz where we said goodnight - a lovely start of my Vienna trip! @Drama Queen: πού θα πάει, θα πας κι εσύ! @MenieK: You should be, it is one of the best cities in the world! @Zeugolator: Μόλις την ανέβασα, θα περάσετε τέλεια!